If you were jealous of Julie Powell for turning her cooking blog into a book deal into a multi-million dollar film, then just wait. Blogger, Frenchwoman and former supermarket cashier, Anna Sam has been given a book deal and a movie deal based on her blog. But wait, there’s more! She also has been offered a musical deal (which is, of course, where the big money is) produced by the Paris actor and director Jackie-Georges Canal, a comic book version of the book will be published, and she has been offered a second book deal! Oh yeah, and the original book she wrote is an international best seller, which has now been published in sixteen languages. The book that sprang from her blog, Les Tribulations d’une Caissière (translated as Checkout: A Life on the Tills), chronicles her misadventures behind the register dealing with odd characters, silly supermarket situations, and the frustration that comes with minimum wage work. At the age of 20 Sam began working as a checkout clerk while getting her degree in literature. It was supposed to be a temporary gig but when graduation came and went with no job prospects on the horizon, she decided to stay on. After a few years of hello-ing and thank you-ing without so much as a nod of acknowledgment from the customer, Sam decided to start recording her experiences on a blog. Seen as a “voice for the underdogs,” Sam’s blog attracted a large following of readers as well as reporters. And a star was born. Unsurprisingly, this dame chanceuse has long-since quit her low-wage job, as has her husband who quit his boring computer engineering job to manage her career (see, sometimes it does pay to marry a blogger). 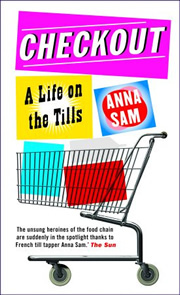 Checkout: A Life on the Tills is not yet published in the US, but you can buy it from Amazon as an import from the UK, and Gallic Books has a sample chapter in PDF form. Time to get excited for what I predict will be the probable next step in her career: Cashiers on Ice, starring Kristi Yamaguchi. If you want to read the original blog, Ms. Sam is still typing away but be forewarned it is, obviously, en Français. And let me tell you, blog French is different than high school or even college French. I tried to read a few posts and understood that it had to do with cars, her boss, and something to do with smoking thus proving that I should really get back to my études françaises. Anyway, I’m sure it’s very entertaining to those who can fully comprehend it — an Amazon review links the book to the movie Clerks, meaning that Sam would be a skinnier, Frencher, more female Kevin Smith…which, while disturbing is intriguing.